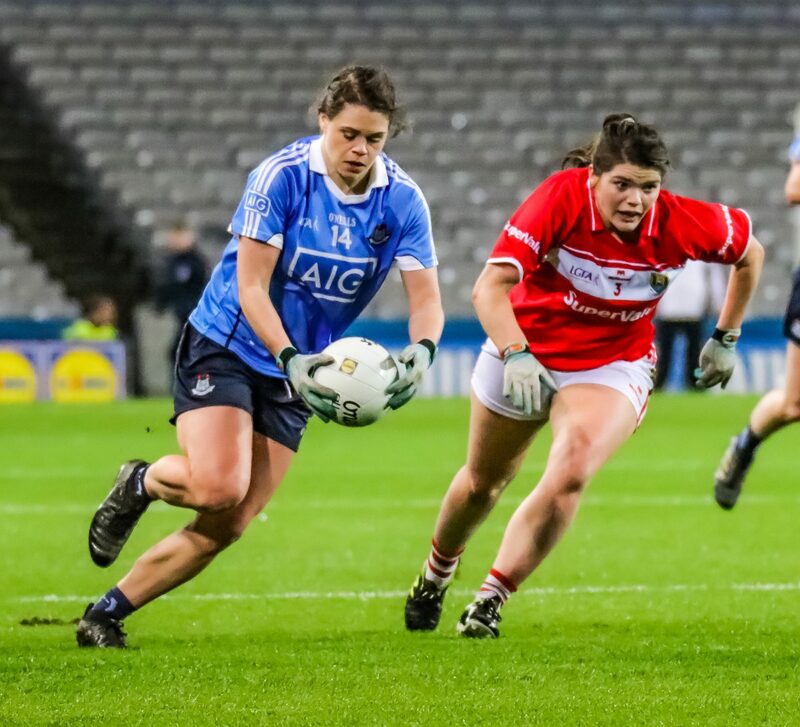 All Ireland champions Dublin held off a spirited comeback by Cork to claim their first win over the Rebelettes in Croke Park on Saturday evening. Both sides headed in the contest with two wins each from their opening two games in this seasons Lidl Ladies National Football League which set up last night battle of the current reigning league and All Ireland champions to be a classic encounter. Cork chasing their sixth league title in a row got off to a lightening start and just as they did against Monaghan last week grabbed an early goal courtesy of a penalty converted by Eimear Scally with only two minutes gone on the clock. 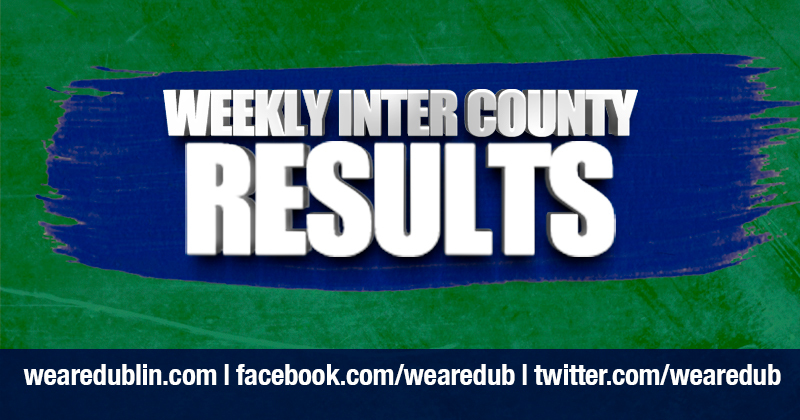 Dublin reacted positively to the setback and broke up field and Noelle Healy split the posts with a fine point. Both sides attacked with gusto and an Orla Finn free pushed the Cork lead back out to three in the fifth. 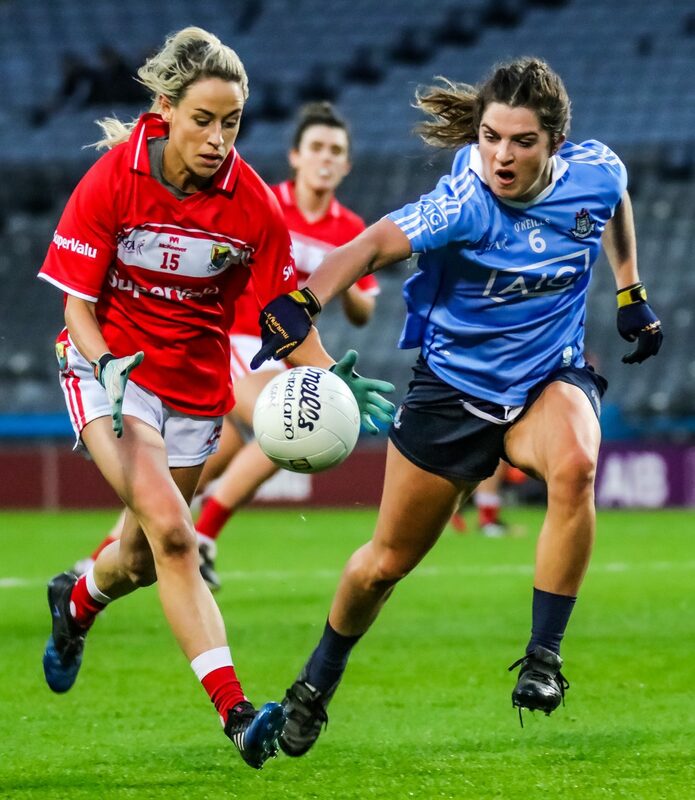 Dublin though we’re now settled into their rhythm and their running game was causing plenty of problems for the Cork rearguard despite Bríd O’Sullivan playing the sweeper role. A free from captain Sinead Aherne reduced the deficit to two but two quick points from Finn and Doireann O’Sullivan put four points between the sides. Noelle Healy was the standout player in last September championship final and back in headquarters for the first time since then she continued where she had left off putting in another player of the match performance. Her direct running cut the Cork defence to shreds and after Sinead Aherne put a goal between the teams with a nice point, Healy cut through the Cork backline from the right hand side and put midfielder Olwen Carey in on goal and the Thomas Davis player planted the ball to the back of the net past the advancing Cork netminder. Cork briefly retook the lead in the 16th minute thanks to a converted free from Finn. But another incisive and defence splitting run by Noelle Healy yielded Dublin’s second goal, Healy again cut in from the right and hit a perfect handpass across the square to the onrushing Carla Rowe to palm the ball to the net. The sides swapped a brace of points to the break with the Cork scores coming from Orla Finn and Orlagh Farmer and Dublin’s replies from Oonagh Whyte and Noelle Healy giving the girls in blue a two point advantage at the short whistle with the score 2-05 to 1-06. Dublin manager Mick Bohan made a couple of changes at halftime with Rebecca McDonnell, Niamh McEvoy and Lucy Collins entering the fray and the Dubs got the perfect start to the second half as the impressive Olwen Carey again broke forward from her midfield berth to finish off a sweeping move for Dublin’s third goal of the game. 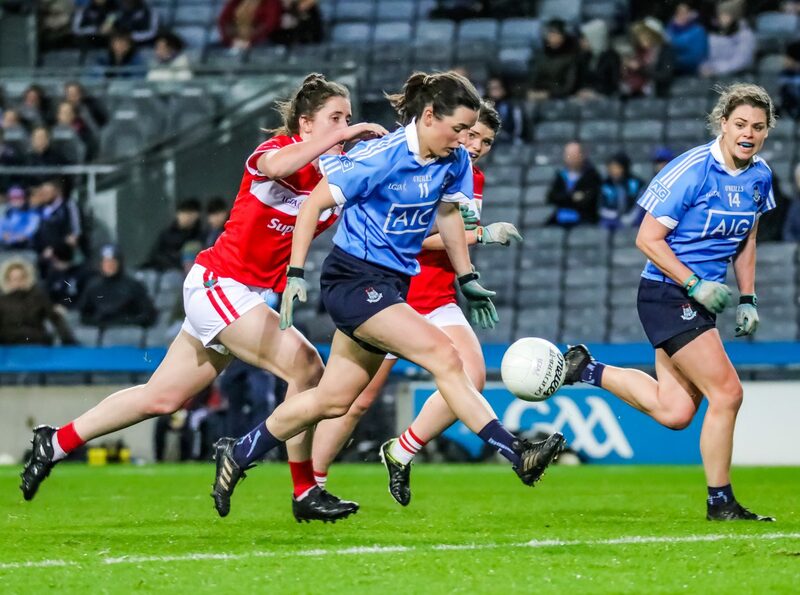 The Sky Blues were now flying, Healy and Cork’s Ciara O’Sullivan swapped points and then three points in a row from Lyndsey Davey, Carla Rowe and Healy put Dublin in a commanding position and even at that early stage of the second half there looked to be only one winner. 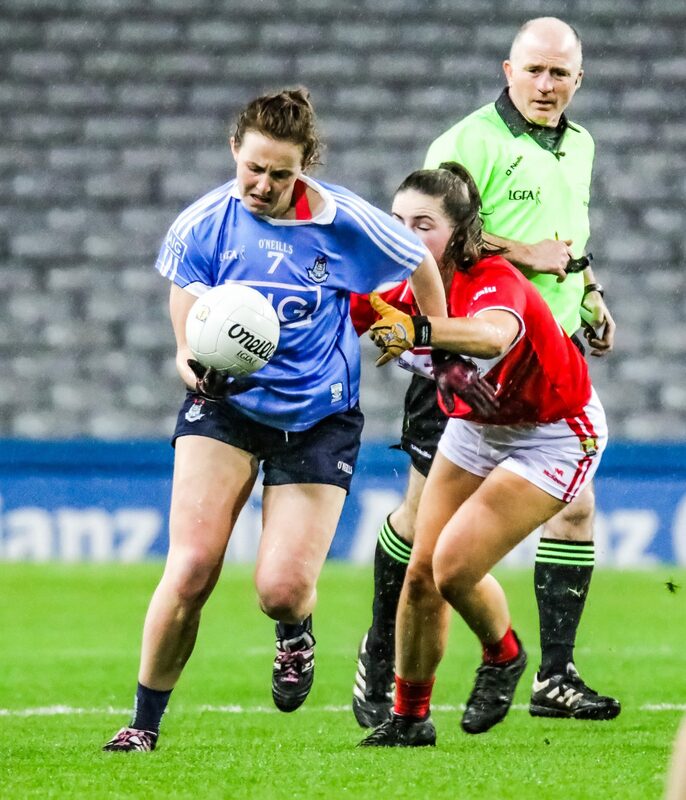 Orla Finn chipped away at the Dublin lead with two points and then the 45th minute sin binning of Katie Murray changed the whole momentum of the game back in the Rebelettes favour. 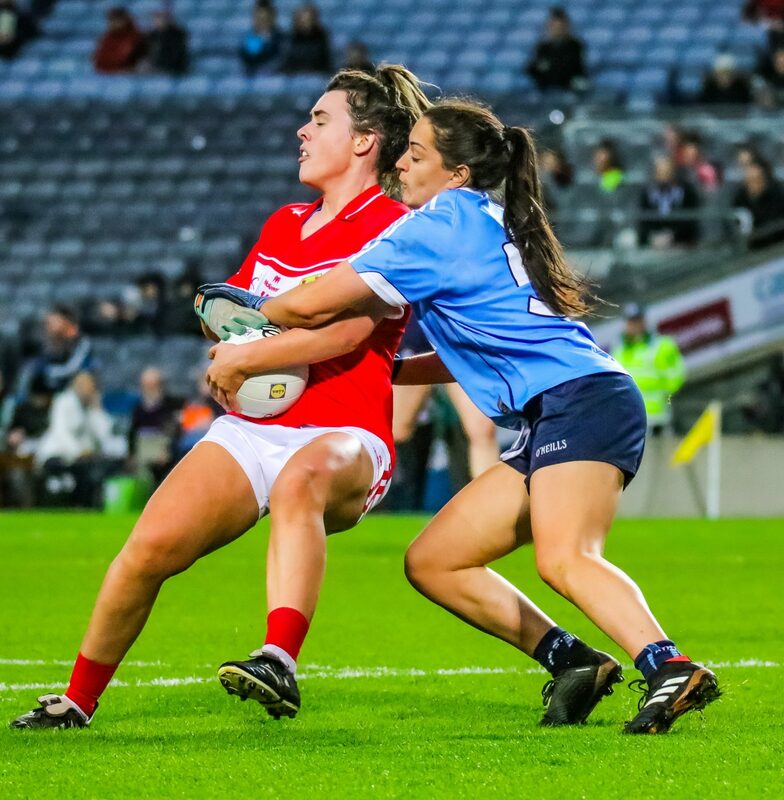 A Ciara O’Sullivan point cut the lead down to just six points and Cork we’re now coming in attacking wave after attacking wave with Dublin having to dig deep and put a big defensive shift in. 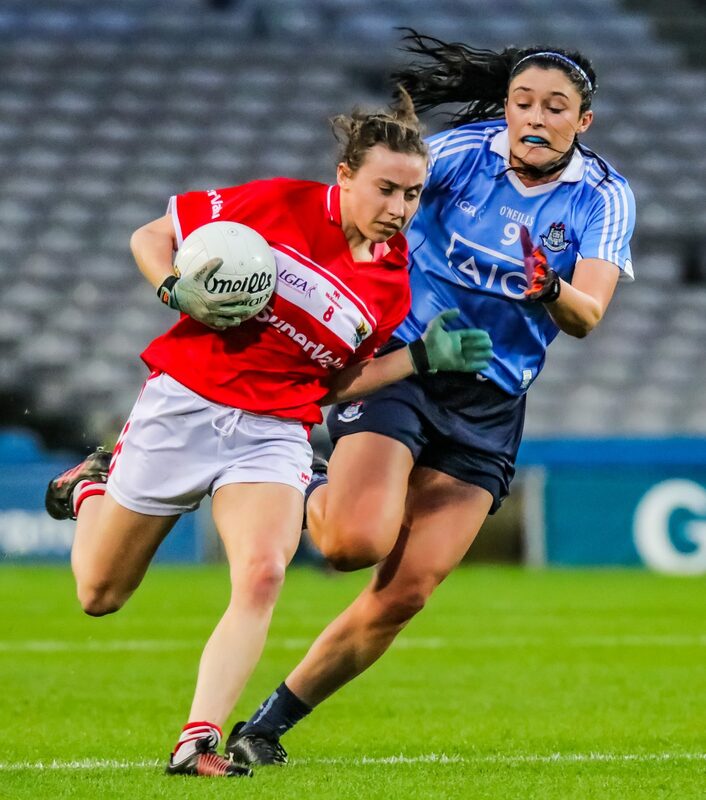 The Cork momentum was briefly halted with the sin binning of their own Doireann O’Sullivan, but Dublin were struggling to make any headway up front and Cork grabbed two more points from Ciara O’Sullivan and Melissa Duggan. 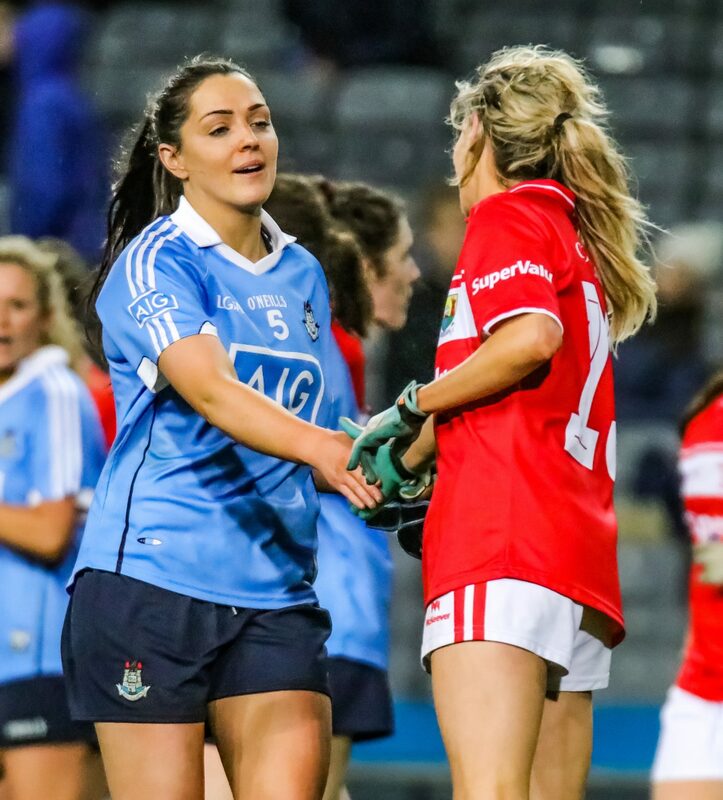 Three points now separated and with four minutes left on the clock Dublin were dealt a blow when Lucy Collins was sin binned and it was backs to the wall for the remainder of the game. Dublin defended heroically repelling Cork attacks, turning over the ball and forcing rushed passes and shots in the dying embers of the game. An Orla Finn free with a minute remaining put two between the teams. It was still that way as the clock ticked down to the final whistle and just as time was up Eimear Scally pointed to put the bare minimum between the sides. But time ran out for Cork to grab an equaliser and DUblin held on to claim the win and bury the ghosts of 2014, 15 and 16 once and for all.